When I grew up I used to play a lot of roleplaying games and I still have most of them in a box put away in the attic. Most of the time me and my brother shared the game master role while our friends more liked to play. Already by then when I got a new adventure I always started with looking at the maps. I could sit for a long time looking at the different maps just trying to imagine the different places in my head. Best of all were the coloured maps that usually were included in the more costly adventures. The other day I started to look through my old stuff and found all the old maps and adventures. And I thought it could be fun to try to redo some of the old maps myself in Campaign Cartographer 3. The first map I decided to make was a map of the area Torshem that was from a campaign/adventure. The module mostly described the area and included some adventures that were loosely linked, and then the players very much could just investigate the area and pick up the threads they stumbled upon. I remember the adventure as a very good one that we all enjoyed. The map is made in the style I made for Profantasy and took me around three hours to complete. 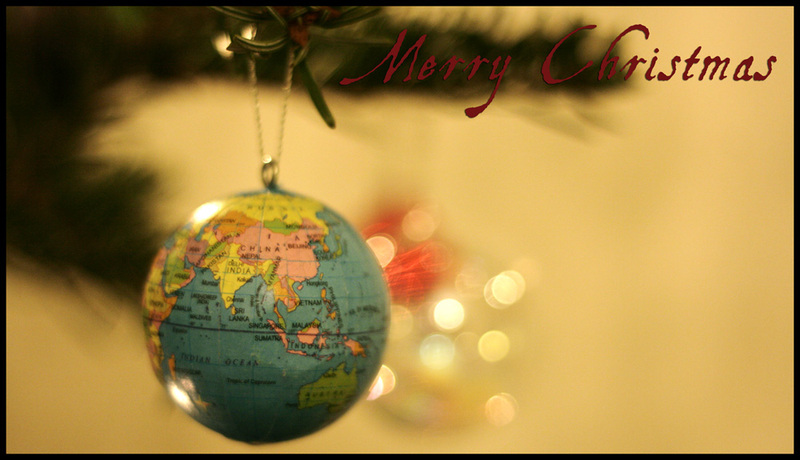 I guess that labeling the map in Photoshop took most of the time. The map itself is rather simple with not too many objects in it. It was originally the player map that only shows the known locations, in the game book you had a separate black and white map for the GM showing all the locations. The map was a great nostalgic trip to do so I’m probably picking up some more maps to redo from old adventures. It is also a great way of practicing you skills in CC3. In the last post I published a mind map for an adventure, now it is time to start making maps. First of all I need a campaign map of the area where the actual adventure will take place, with that one in place it will be easier to plan the other maps I need to draw. To make the map I decided to use the style I made for the December issue of the Annuals from Profantasy. The style was made for creating campaign maps for smaller areas, so it will fit very well for this map. 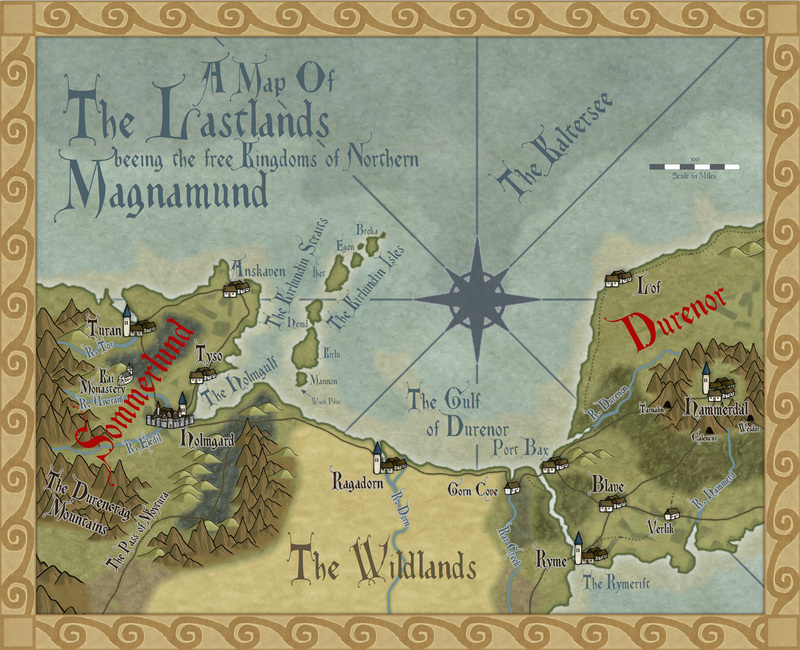 The adventure will take place in the country Armadien, close to a city called Vadsbro (Littlebridge in my Armadien map). Vadsbro is situated close to the Armadien border, next to the Traal infected Skymningsskogen (dusk forest) and the Traal mountains, so there will be a lot of forest in the map. As soon as I started on the map I realized that I had to improvise a bit with the style. 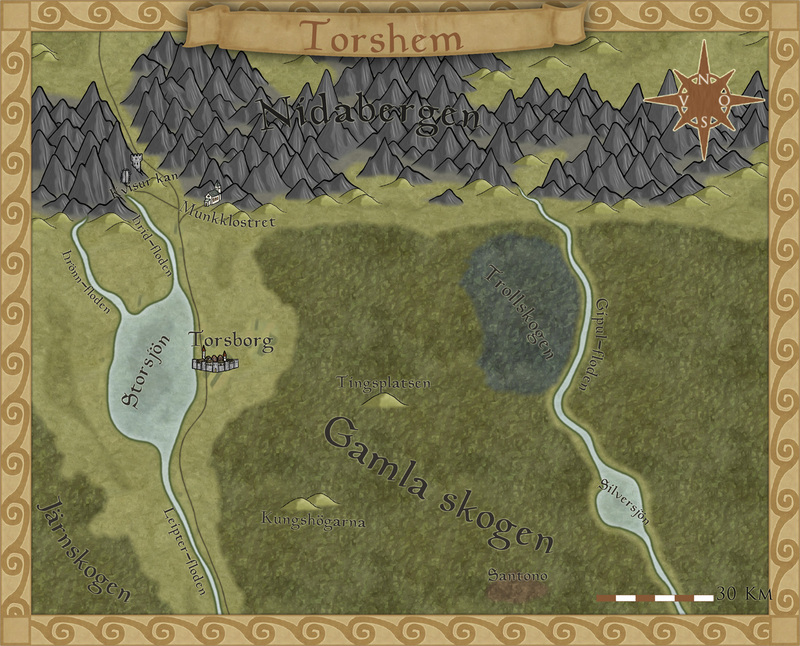 The main feature in the map, except for all the forest, is the river that split up in two rivers closer to the mountains. The rivers in the style aren’t really suited for depicting a main river in this scale, so I decide to use the ocean texture for the rivers. In this way the river will look more like the dominating natural feature in the area. The river tool however comes in handy to show smaller rivers connecting into the main branches, but I had to change the colour of the rivers to blend in more with the main rivers. 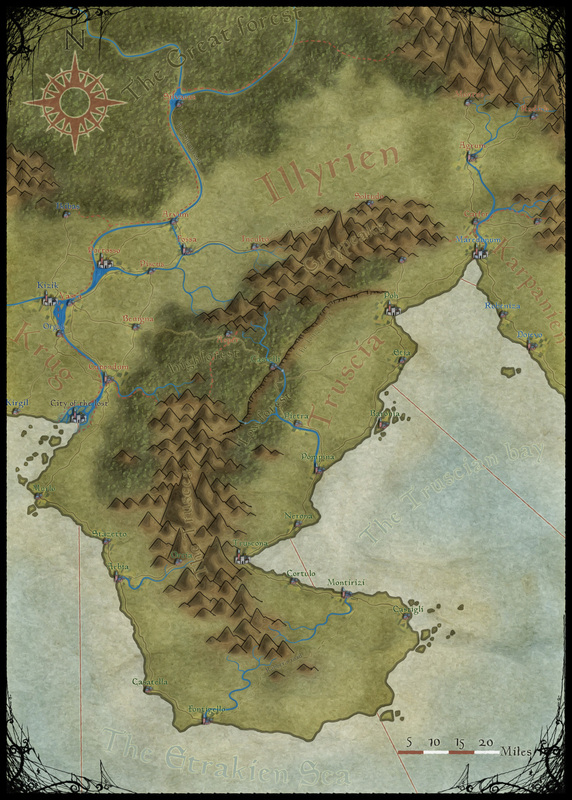 When I created the style, which is based on my Truscian map, I wanted the rivers in a darker colour and the ocean in a lighter one. That works very well if you do a more zoomed out map. But if you zoom in closer to an area for a map, and you suddenly want to use the ocean textures as rivers, the colour for the river tools don’t really blend in. So I decided to change them. It is actually quite funny how a style you’ve created yourself, suddenly needs to be trimmed when you start working with it. But I think you can say that for all styles. At least I always trim the styles so they’ll fit into my way of working. Now that the map is done it will be easier to decide what more maps I need to do. You can say that I’m making my adventure from the maps, the story I have so far will probably change a bit with every map I make. But that is the fun part of mapping, to weave a story around your maps instead of making maps from your story. As I’ve stated before I always find it much easier to make a map if I have a story to tell. The story usually give you ideas for details that will lift your map to a higher level and that makes it more interesting and appealing to look at. Lately I’ve found myself sitting with no ideas what to map, I just felt empty when I tried to come up with an idea. To solve the problem I decided to try to make an adventure. I don’t know if I ever write it down on paper but I felt I had to make a story from which I could get ideas what to map. When I used to play RPG’s I always enjoyed adventures where the story was kind of free. With this I mean where the player feels he is in charge of what to do and where to go. The opposite would be a more restricted adventure where you go from event one to event two and so on. Of course all adventures are event driven in one way or another, and the story isn’t as free as you want the players to feel. But the important thing here is to make them feel like they can do whatever they want to. 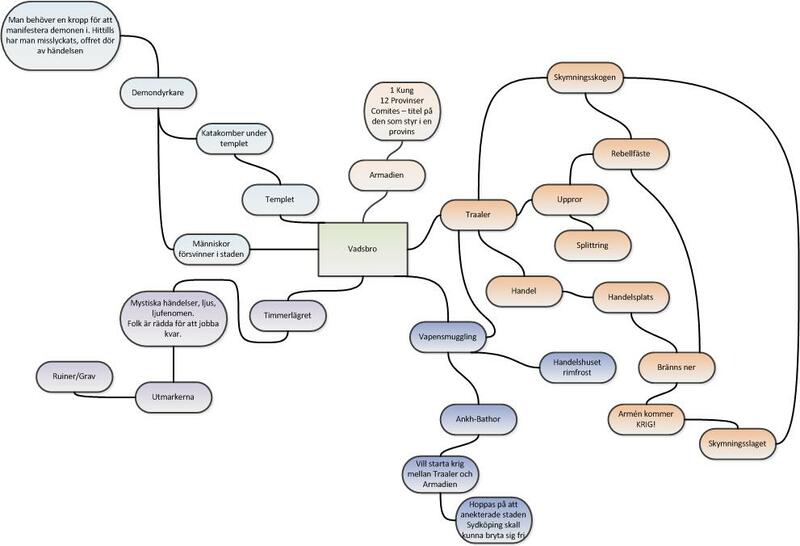 So to make this work out I decided to make a mind map of my adventure, in this way I can easily plan what will happen, what events are linked to each other etc. I also get a clear view of what kind of maps I need to make, which is kind of the reason for the whole mind-map-an-adventure thing. So what is the story then? 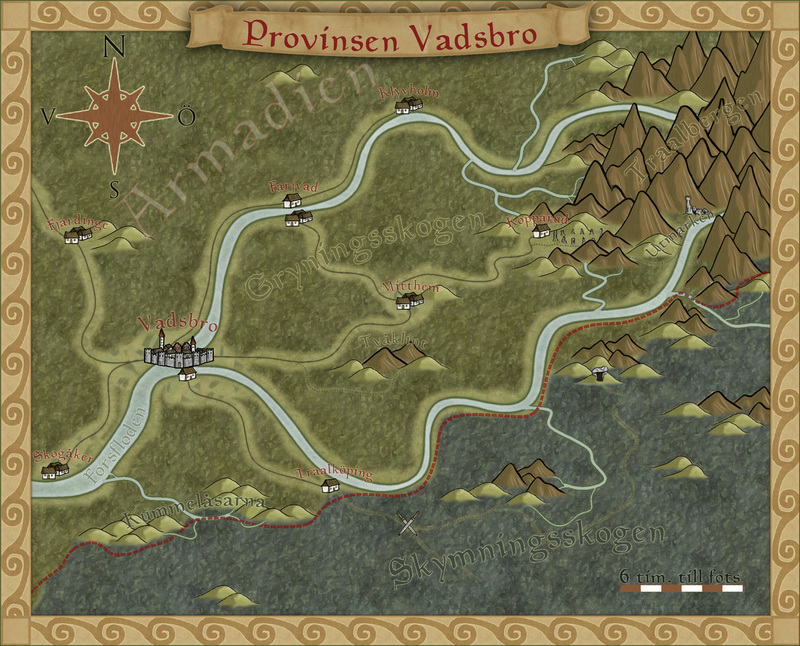 The adventure will take place in Armadien in the Etrakien world, in one of its more remote placed towns called Vadsbro. Vadsbro is the central town in one of Armadiens twelve provinces, a province centered on trade with timber, skins and copper. But strange things are happening, there are reports of people gone missing in town and strange sounds can be heard during the nights. North of the town the miners have reported that they’ve seen strange lights in the forest close to the mountain and to the east the Traals are restless and a rumor is around that someone are selling them weapons of steel, which of course is a hefty crime. So finally the style I’ve made for Profantasy has been released. I must say that I am very pleased with the end result and the work the people at Profantasy has done to turn it into a style. 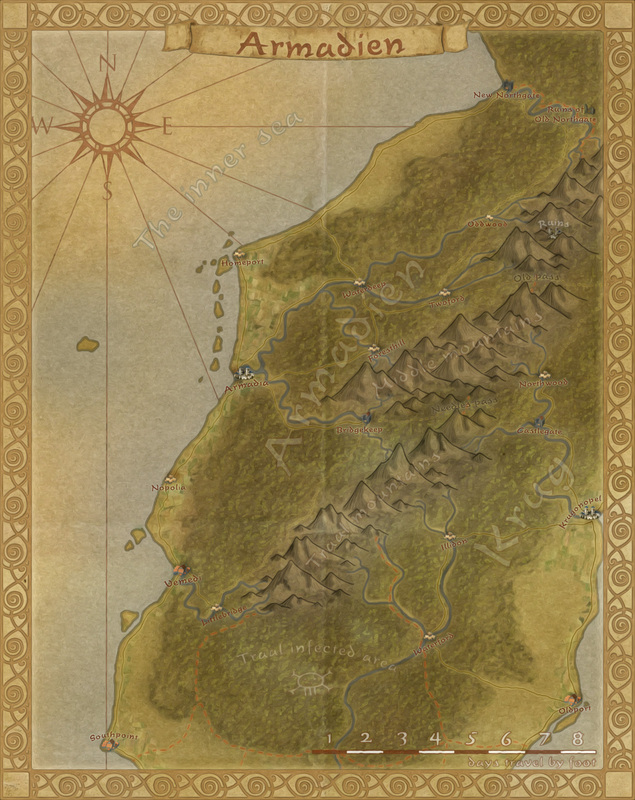 It actually feels kind of strange to make a map in CC3 and use graphics you’ve done yourself. One thing I’ve learned from making the style is that my biggest strength when it comes to mapping is the big picture. With this I mean things like placing terrain in the right places selecting colours that blend good with each other etc. The small things are usually what cause me problems, things like symbols for villages, towns, fortresses and so on. So in making this style I really had to push myself into areas I’ve avoided earlier and I’ve learned a lot from it. The process actually started some time before Profantasy contacted me about the style. When I decided to start to make more close up maps of the Etrakien world I really had to start to make symbols for cities and villages, but I didn’t feel ok with the things I produced. If you for example look at my Armadien map you can see that all the city icons actually are from different styles in CC3. None of them are my own artwork. But I felt I had to jump the cliff on this and make some icons on my own. I think the biggest problem I had was to transfer my drawing techniques to the computer. And it was first when I discovered Artrage I felt that the pieces started to fall in place. With Artrage I got the tools that made me feel like I was drawing on paper again, but instead everything was done digitally. So I started to look through tons of videos on youtube and reading articles about Artrage to learn the program. Of course I also had to do a lot of testing and drawing in the program. But in the end I actually made all the line work for the December style’s symbols in the Artrage, for different reasons I however did all the colouring and shadowing in Photoshop. So for me working on the December style for Profantasy has really forced me to push my mapping skills to a new level and I now feel much more comfortable when it comes to making symbols for future maps. But you can really say that Artrage saved the day here, so buying that program was probably some of the best money I’ve spent. The map in the beginning of the post is a map made by Ralf Shemmann and is a remake of a map from the lone wolf adventure books in my style. I feel that it very much accomplish what I hoped for while working on the style. So hopefully some of you who subscribe to the Annuals will find it useful.